In a previous life, long before Redline Guiding, owner Mike Cherim owned and operated a national commercial mailorder company he founded in 1992, that went by the brand name Green Methods (long sold, though still exists, now owned by another firm). Green Methods sold good bugs that ate (or parasitized) bad bugs — to be used for pest control purposes, instead of nasty pesticides. This gave commercial growers, gardeners, and various institutions (oh, and Green Methods had an A-List of clients ranging from Universal Studios, Orlando, to Johnson Wax) a safer biological option to thwart pests as part an IPM or Integrated Pest Management Program. It was good science and it still is. As we do here at Redline Guiding, we spent a lot of time sharing, trying to educate people — we used to blog then, too (just about all the articles you’ll find on their site today were Mike’s) — and one article we produced around the turn-of-the-century shared this piece’s title. It was a pretty popular article because it offered a fairly creative and unique solution to the growing tick problem (yes, even back then). It never went “viral,” per se, not even by then-standards, but it did slowly catch on so that nowadays one will find many replications, reprints, and variants of the crude technology offered at the time. Find a large Styrofoam cooler — big enough to contain a block of dry ice — and using a knife or hole saw, cut 1/2″ to 3/4″ holes near the bottom of the cooler, one on each side. After the four holes are cut, secure the cooler to the center of a half-sheet of 1/2″ plywood (4’x4′). You can do this with double-sided tape, screws with fender washers, etc. Whatever works. About an inch from the edges of the plywood apply a layer of “Tangle Trap Insect Trap Coating,” petroleum jelly, or even double-sided carpet tape. 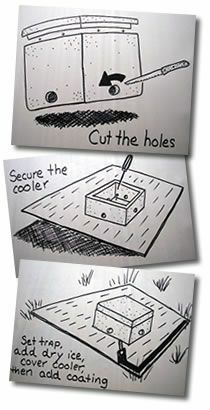 Place this cooler/plywood unit on a grassy area near your house then, using tongs, goggles, heavy gloves and protective layers, add a block of dry ice to the cooler and secure the lid. And that’s it. Just sit back and wait. The dry ice will “melt” reverting to its gasous state from solid form. Specifically the gas is carbon dioxide. The same stuff mammals exhale. And the same stuff ticks (and mosquitoes) are attracted to. Drawn by the CO2 ticks will advance to the source of the gas, the cooler, looking for a free meal. In doing so they will try to cross the sticky barrier and mire themselves in the process. They will slowly die in place, suffocating as the goo pulls them in blocking their spiracles or breathing holes located along the side of their body. All you have to do to maintain this trap is keep the sticky band clean enough to function so you can actually trap the ticks and change out the dry ice. Employ it once every couple of weeks, especially in the spring and early summer. Other options, nowadays, may be to use a CO2 generator — used to draw and trap mosquitoes — in lieu of the cooler and ice. In fact, since finding and using dry ice is difficult, and being that a CO2 generator will do double duty, it might be worth looking into. Otherwise… well, raise free range chickens or guinea hens. They love ticks. In the name of protection for your family, friends, and especially your pets and other animals, this is worth doing. While it won’t offer protection while adventuring elsewhere, at least you can be safer at home in the comfort of your relaxation spaces.